(Innate): Each of Syndra's basic abilities gain an extra effect at maximum rank. Dark Sphere (Active): Conjures a Dark Sphere at a target location, dealing magic damage. The sphere lasts for up to 6 seconds and can be manipulated by Syndra's other abilities. Transcendent Bonus: Deals 15% bonus damage against Champions. Force of Will (Active): Grabs a dark sphere, enemy minion or neutral monster. Dragon and Baron Nashor cannot be grabbed by this ability. (Active): Throws the grasped Dark Sphere or enemy at a target area. Enemies struck take magic damage and are slowed for 1.5 second. Transcendent Bonus: Increases the slowing duration by 33%. Scatter the Weak (Active): Knocks enemies and Dark Spheres back, dealing magic damage to them and any enemies they collide with. The distance of the knockback increases depending on how close the affected units are to Syndra upon cast. Dark Spheres that are knocked back also stun all enemies in their path for 1.5 seconds. Transcendent Bonus: Spell width increased by 50%. Unleashed Power (Active): Draws upon Syndra's full cataclysmic power, harnessing all Dark Spheres to deal magic damage per sphere. This spell has a 3 sphere minimum damage, as Syndra uses the three spheres floating around her. All Dark Spheres remain on the ground for 6 seconds after Unleashed Power is used. Throughout her youth in Ionia, Syndra's reckless use of magic terrified the elders of her village. They took her to a remote temple, leaving her in the care of an old mage. To Syndra's delight, the mage explained that the temple was a school -- a place where she could develop her talents under his guidance. 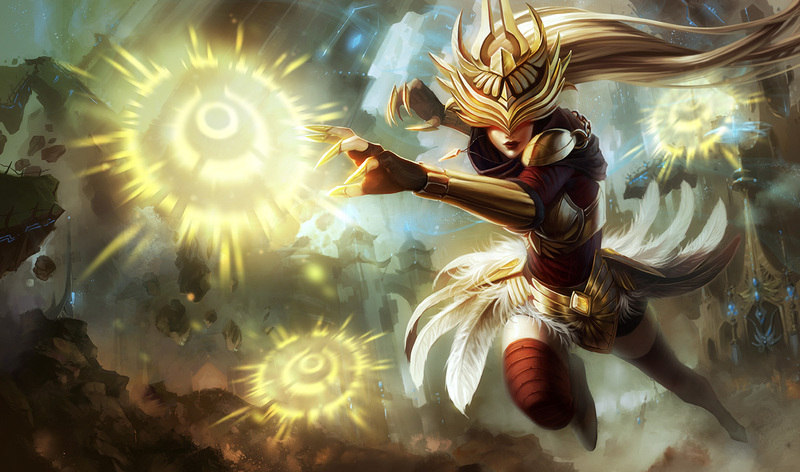 Though she learned much during her time there, Syndra no longer felt her power growing as it had in her youth. Her frustration grew, and she finally confronted her mentor, demanding an explanation. He revealed that he had dampened Syndra's magic, hoping to help her learn control and restraint. Accusing him of betrayal, she advanced on the mage, commanding him to lift the spell that was holding her back. He backed away, telling her that if she couldn't control herself, he would be forced to nullify Syndra's magic completely. Furious, she summoned her power and dashed the old man against the walls. With her mentor dead, Syndra felt the rush of her unbounded potential for the first time in years. Though she had won her freedom, she refused to return to the society that had tried to steal her gift. Instead, Syndra decided to claim her former prison as a stronghold. Pushing the boundaries of her magic, she tore the structure from its foundations and raised it into the sky. Free to delve further into her art, Syndra now aims to grow powerful enough to destroy the weak, foolish leaders of Ionia -- and anyone else who would dare shackle her greatness.